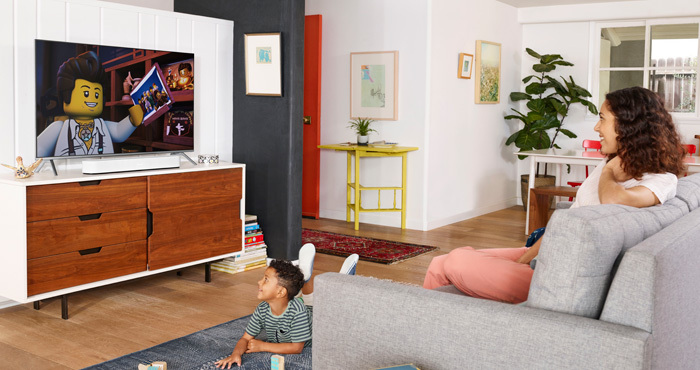 Wherever you watch TV and movies, you need room-filling sound and the Sonos Beam soundbar delivers. But it is also a smart speaker, with Amazon Alexa built-in, and can serve as a speaker in a whole home audio system. As a speaker, the Beam has four full-range woofers, a tweeter and three passive radiators (to add warmth to the bass) powered by five Class-D amplifiers. It measures 2.70 x 25.625 x 3.94 inches, which makes it small enough for bedroom TVs, but with enough power for your main entertainment center. Two technologies are built-in to enhance TV and movie watching: Speech Enhancement, which boosts the voice frequencies for clearer dialog, and Night Sound, which flattens the volume, making the quietest scenes louder and loudest scenes quieter. And, if your TV has an HDMI ARC port (most do and they're clearly labeled), you can control the Beam with your TV remote when you plug it in. As a smart speaker, the Beam is a fully-functional Alexa-powered device. It has a five far-field microphone array with beamforming to better hear your commands, even when you're playing music. And, the Beam works with all of Sonos' other speakers as part of a Sonos whole home audio system. Just in time for holiday gatherings, Sonos has introduced a fun party game that you can play with your Sonos. In the style of Apples to Apples and Cards Against Humanity, the Sonos Game has you playing DJ, following a prompt to pick the best song that matches (according to the person playing the MC).